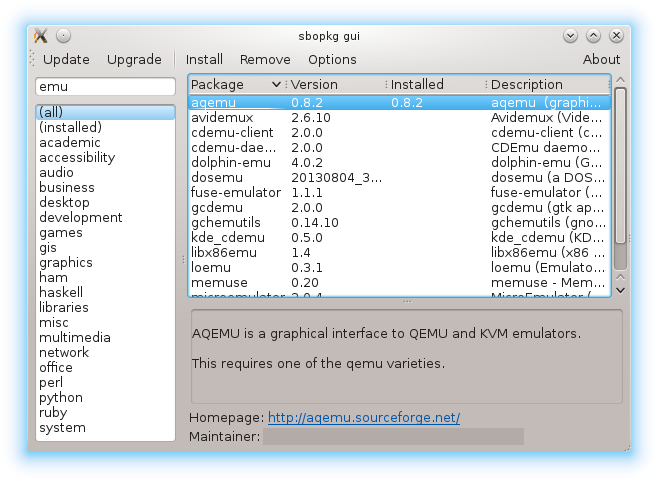 a package manager for Slackware Linux. extends sbopkg with handy features. Browse existing SlackBuilds with normal user privileges. Dependency resolution by recursively traversing the REQUIRES fields. are part of a full Slackware installation: PyQt, python. A Slackware package of sbopkg_gui is found at the bottom of this page. that can be chosen to upgrade. Show last changes from ChangeLog.txt if no package is selected. has been replaced by a convenient dialog. an error if the given call throws an exception. Added error messages to show incorrect settings. Size and position of the main window are saved. Minor changes in config file loading. The search is now case-insensitive.